Here’s a compelling question: Do we make rational or emotional investment decisions? You may consider yourself as someone who carefully considers every financial decision, but when it comes to selling and buying dollars and euros, we have found some behavioral trends that imply people often make trading decisions based on emotional factors such as: day of the week, weather, or even if a beloved sports team wins or loses. Experts in behavioral science and finance have spent decades studying why investors make their choices, what impacts major trading decisions, and what we can all learn about how the human brain acts during money time. As business intelligence believers, we used Sisense’s agile BI software to crunch data on the behavior of traders together with different external factors that can trigger emotional reactions to determine the most strategic time to exchange dollars to euros. Business Intelligence is about finding the facts, getting 100% accurate numbers, and uncovering correlations and trends. But we are calling upon you, our audience, many of whom work in trading, finance, banking, and different fields in psychology, sociology, and behavioral science, to give us possible insights as to why these interesting correlations occur. Looking at exchange rate data from years 2000 through 2014, we picked up a pattern that reveals Monday has the lowest total exchange rate (dollar to euro). Monday is therefore the best time to sell dollars and buy euros with a 2-3% lower total exchange rate. On the flip-side, Wednesday and Friday are the best days to sell euros and buy dollars. Is this because Monday is notoriously a tougher day to get through with the “Monday Blues”, while Friday, the day before the weekend is so relaxed that some offices have even implemented “Casual Friday” dress code? You’ve all heard of Seasonal Affective Disorder, which depending on the person can either mean winter blues or summertime sadness (you said it. Lana Del Rey). Well, taking the data from the weather in New York City, there appears to be a correlation between when the weather gets warmer or cooler by 3º C (5.4º F) from the previous day, and the exchange rate. 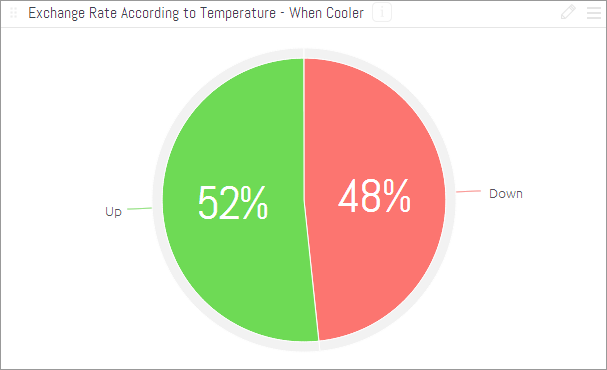 When the next day is cooler by 3º C or more there is a higher chance that the exchange rate will go up and vice versa. 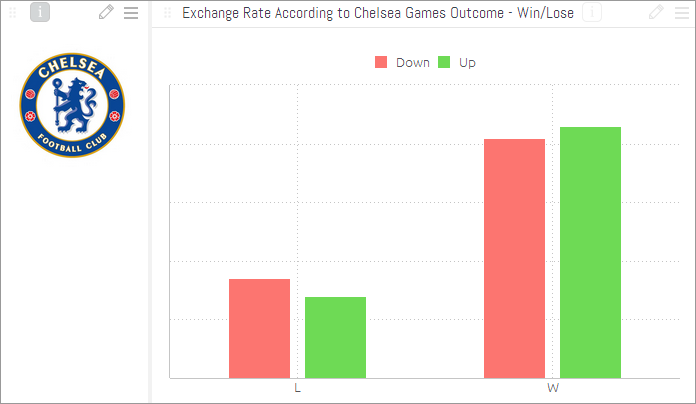 That’s right for all of you Chelsea fans: If Chelsea wins, it is more worthwhile to buy dollars and sell your euros on the next trading day. 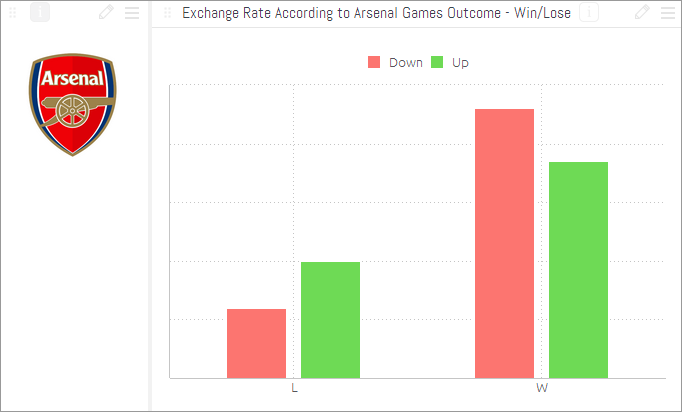 Sports and finance have always been intricately connected with trading and betting money, but we see just how much the emotional impact of a team’s win or loss has on the market. So, we’re calling all Chelsea and Arsenal fans to theorize why this may be so. Could the underlying perception that Chelsea is the team of the elite, and Arsenal the team of the people be a reason for this trend? Are traders generally Chelsea or Arsenal fans and what emotions would they be experiencing that would explain this phenomenon? Comment below to let us know your insight! Got some time to kill? Take our Which Chart Are You quiz to discover which data visualization best describes your own personality. Want to start analyzing public data yourself? Download a free trial of Sisense business analytics software and reach your first insights today.